I get a catalog called “Bits and Pieces.” They have interesting puzzles and games, I have no idea how I got on this mailing list, and one of their offerings stopped me cold. I posted it on my Facebook page, and the comments that ensued made the puzzle twice as funny. If you need a white elephant gift, or want to send a subtle message to someone, this puzzle is still available. Tell me one thing that is not just WRONG WRONG WRONG with this. Well, you certainly don’t need the plunger in an outhouse! You mean other than you made me look at this? It answers the question of whether or not bears sh** in the woods. My personal opinion is that “fun-filled” “outhouse” and “puzzle” do not belong together in ANY situation. And yes, what is that raccoon doing with that plunger? 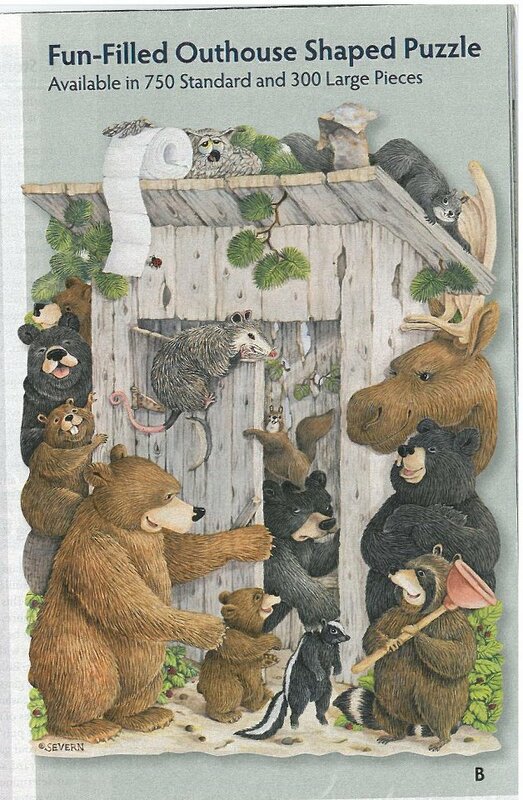 That one bear who is already IN the outhouse looks like he is picking up the skunk to use as toilet paper. Besides, everyone knows that moose are better plungers than racoons. Duh. And it is aparently not only unisex, but also unispecies. That is just unforgivable. well yes, he needs to use the skunk for toilet paper – the owl is hoarding his! The bear in the outhouse also looks really disgusted. Can’t he get just five minutes to himself?!?!! Yes, I was going to say that … where is the privacy? ‎Cyndi Frailing Nelson, since you “liked” this post, does that mean you want me to get you this puzzle for Christmas? Not only no privacy, but he has a squirrel standing on his head! And the opossum was obviously making rude personal comments. Well of course he needs to pick up the skunk as tp because the owl is holding the real roll hostage on top of the outhouse. And why does the owl look so drunk? It’s using the TP roll to keep itself upright. The owl looks drunk and or hungover, perhaps THAT is why he needs all the toilet paper. We spent many hours as kids doing puzzles, since we had only 3 TV channels (and we didn’t even have color TV until I was 9??? or so) although I do think I remember I preferred a good book or a rousing game of Life or Go For Broke. Or Monopoly, with unlimited borrowing from the bank. Puzzles were one of the default gifts of choice at the Spring Creek School gift exchange, I remember one with kittens. Puzzles or paint-by-numbers, which I was spectacularly bad at. Oh, if I could find one of those, I would scan it in. We had one HUGE on that was a Caterpillar (dirt mover) that my Dad must have gotten from the Cat dealer (or maybe at an auction). That one was up on the card table for a LONG time as we put it together. My mom has a large collection of puzzles, all that she had plans to do in her retirement, or do and then give away, once she determined if all the pieces were there. Needless to say, there is a big box of puzzles that are still undone, as she has had other priorities. So what did you do as a kid for entertainment before 148 channels of cable or satellite, and the internet? We played outside, rode our bikes, jumped ropes, played tag and kick the can. Oh yeah, and we drank straight from the hose and didn’t die.